The French government is expected to announce extra security measures shortly to protect central Paris from further vandalism during violent gilets jaunes ("yellow vest") protests, BBC reported. A PSG store was among those damaged during Saturday's unrest, which involved an estimated 10,000 protesters. The video, tweeted by journalist Rémy Buisine, veers away from the policeman dramatically seconds after he was filmed, and Buisine is heard shouting: "Why are you hitting me like that? What right have you to hit my phone?" The "yellow vests" began weekly protests across France four months ago, initially because of fuel tax rises. The movement escalated into a broader revolt against perceived elitism, for which activists blame President Emmanuel Macron. The famous Fouquet's restaurant - a haunt of some previous French presidents - was badly damaged in Saturday's clashes. Later Prime Minister Edouard Philippe admitted there had been security "flaws" which would have to be addressed. Mr Macron cut short a skiing holiday and vowed "tough" action in response. "Now that's the end. I demand that such scenes must not be repeated, especially on that avenue," he said. The "gilets jaunes" mobilisation was bigger than for similar demonstrations in recent weeks. Business executives are to hold "crisis" talks with Economy Minister Bruno Le Maire on Monday, Le Figaro daily reports. 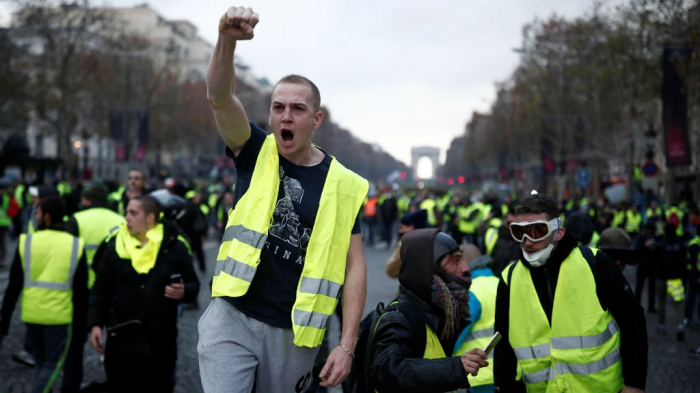 Mr Macron offered concessions to the protesters after the movement swept the nation - including €10bn (£8.5bn; $11bn) designed to boost the incomes of the poorest workers and pensioners. But they failed to quell the discontent. For the past month he has toured France, listening to local mayors and citizens as part of his "grand débat" - a big national debate.